Another of the "sundry loose negatives", but one that holds some points of interest. 7029 Clun Castle heads a train of enthusiasts (?) past Southcote Junction. The date is uncertain. 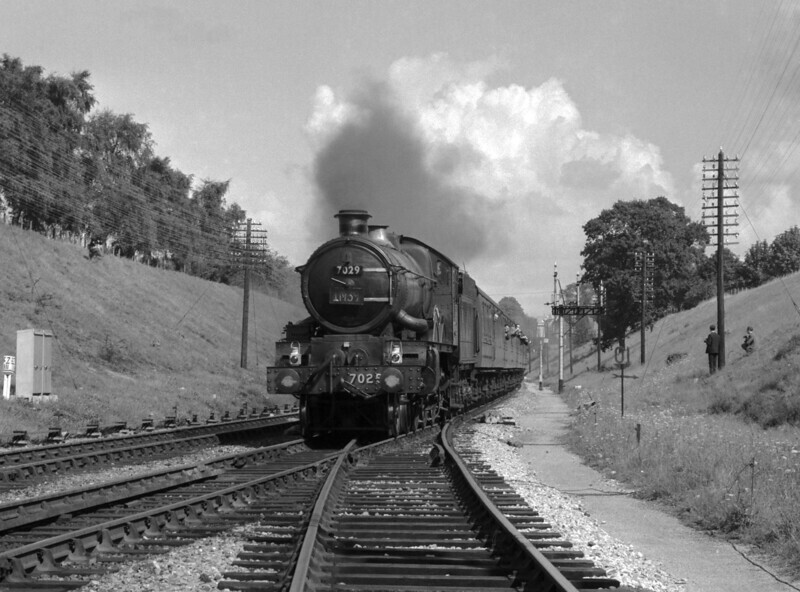 However, 7029 was withdrawn from service in December 1965 and was noted by the "Railway Observer" as working the last steam roster on 1M39 from Penzance to Wolverhampton on 4 September 1965 (by special request of the Cheltenham branch of the RCTS). In this shot, 7029 still carries the 1M39 head-code. Also of note is that the triple bracket is now devoid of its signal arms and colour light signalling is in place.